While the news about taking too many antibiotics is now common knowledge, there is another underlying danger that the public is not aware of. As beneficial as this class of drugs are, there is a widely prescribed family of antibiotics that is highly destructive. Called fluoroquinolones, they are better known under the names Cipro and Levaquin (as well as four others). What You Must Know About the Hidden Dangers of Antibiotics, has two main goals. The first is to expose the truly destructive capability of these drugs to cause serious, sometimes long term and permanent injuries. The capacity of these drugs for such damage has been attested to by the government’s own watchdog agency, the FDA. Hundreds of patients, many of whom are quoted in this book, have confirmed their long-lasting injuries to the book’s author, Dr. Jay Cohen, while many hundreds more have been ignored or dismissed by their own physicians. As this book will show, being brushed off and dismissed as simple side effects essentially allows these manufactures to hide these problems from public view. The second goal of this book is to provide other safer and effective remedies, solutions, and considerations that may help end the suffering experienced by patients suffering from these dangerous side effects--that can affect many human systems including the musculoskeletal, nervous, psychiatric, gastrointestinal, and others. To do this we explain how these dangerous antibiotics work, and particularly how they injure. By understanding the underlying problems, the alternatives offered in this book can help people potentially reduce their pain reduction, clear up persistent antibiotic-based health issues, and just as important, give them hope. Because so many doctors do not carefully read the FDA’s dire warnings about the risks these specific antibiotics pose, there is little likely patients will be know why they are having such serious reactions. 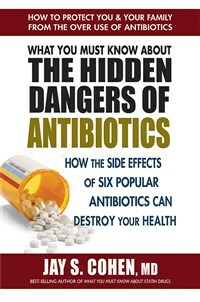 With What You Must Know About the Hidden Dangers of Antibiotics, they may have the answer they are looking for.